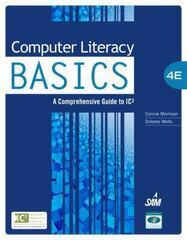 Computer Literacy BASICS 4 Edition Bring your computer literacy course back to the BASICS. COMPUTER LITERACY BASICS: A COMPREHENSIVE GUIDE TO IC3 provides an introduction to computer concepts and skills, which maps to the newest Computing Core Certification (IC3) standards. Designed with new learners in mind, this text covers Computing Fundamentals, Key Applications, and Living Online - everything students need to pass the IC3 exam, and finish the course as confident computer users.